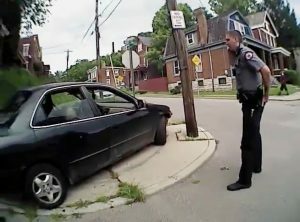 An Ohio judge declared a mistrial Friday in the retrial of a former University of Cincinnati police officer who fatally shot Samuel DuBose in July 2015 during a traffic stop after his vehicle was flagged for a missing license plate. The jury told Judge Leslie Ghiz earlier Friday that it couldn’t reach a verdict. Ghiz asked them to try again. Four hours later, the jury said it was still deadlocked; in all, jurors deliberated more than 31 hours this week. The hung jury comes after two trials in eight months for Ray Tensing, the officer accused of murdering DuBose, a 43-year-old unarmed black man. Ex-officer Tensing, who is white, had faced charges of murder and voluntary manslaughter in the trial that ended this week. The first case, in 2016, was also declared a mistrial after the jury announced they were deadlocked after 25 hours of deliberation. The second trial’s jury announced it was deadlocked on the fifth day of deliberation, surpassing the amount of time the jury took in the first trial to determine an outcome in the case, The Cincinnati Enquirer reported. Tensing, 27, had previously insisted that he feared for his life when DuBose started driving away from the traffic stop. Tensing told the court his arm was still inside the car, and DuBose “dragged” him with his car. Tensing repeated that account for other officers who eventually arrive at the scene. When the former officer took the stand last week, he testified that he thought about the fatal encounter “every moment for the last two years,” adding, teary-eyed, that he replayed the moment “millions of times” in his head, WVXU reported. But prosecutors said video evidence showed the officer was not dragged. Why do so few trials of police officers charged in on-duty shootings end in convictions? Most recently, the officers who shot and killed Philando Castile and Sylville Smith were acquitted by juries who saw video of the fatal encounters. John Yang discusses issues of race and deadly force with David Klinger of the University of Missouri-St. Louis and Brittany Packnett, co-founder of Campaign Zero. Hamilton County Prosecutor Joe Deters has previously said the full 28-minute bodycam footage presented a different scenario. On the recording, Tensing is heard repeatedly asking DuBose for his license. DuBose said he had one, but it wasn’t on him. Then, things move quickly: There’s an exchange about DuBose taking off his seatbelt for the officer. Tensing opens the driver’s door a few inches, but DuBose pulls it back closed. DuBose reaches for the key in the ignition and starts his car. Tensing then reaches into the car with his left hand and yells “Stop!” twice before pulling out his gun and shooting a single shot in the DuBose’s head. The car moves forward about 100 yards as Tensing falls back. “It is our belief that he was not dragged. If you slow down this tape you see what happens, it is a very short period of time from when the car starts rolling to when a gun is out and he’s shot in the head,” Deters told reporters last year. Deters maintained the same point for jurors in the retrial. The family demanded another retrial and called on the community to join them in a peaceful protest “of this unjust result.” It’s unclear whether prosecutors would try the case again, the Associated Press reports.